I was totally surprised this past Father’s Day. Not only did my wife and kids treat me like a king, but they surprised me with some awesome gifts. Who would have thought that my wife knew I needed to upgrade my smoker! As they brought me out to the van (I knew they were up to something), my son opened the back, and low and behold there lied a smoker. Excited? Yes! completely excited. As I had no knowledge of the brand, nor type of smoker, I said I would do some research and see if this was worth keeping for the long run. Unfortunately the reviews were not all that great, and we agreed to do some research and find one that would fit my needs, and work within budget. She was not disappointed, however I kind of was because I wanted to break that smoker in like you would not believe! Anyway, after some research, I decided that I would pursue the Smokenator 1000. Yes, that’s what it is called. I was a bit cautious at first as their website is a bit dated, however, the reviews were rock solid, so I went ahead and purchased it. The Smokenator 1000 works with my Weber Kettle, 22 inch grill, and that is perfect as I did not have to have another large item to store in my garage. 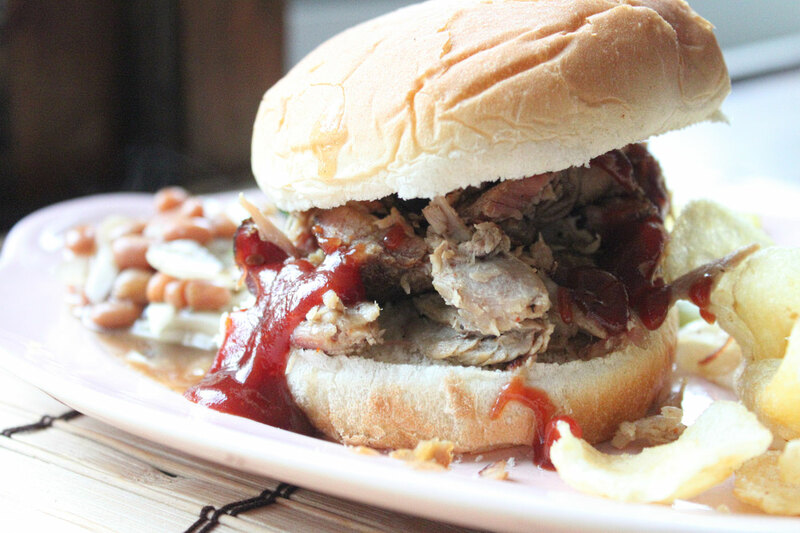 Smoked Pork Shoulder Sandwich using the Smokenator 1000. I was anxious for the product to arrive, and it arrived rather quickly as I ordered it from Amazon.com. The setup was totally simple. Basically attach the supporting grill to the support tabs of the grill. It snugs up against the grill perfectly. Then, add coals into the holes, and heat about 20 coals in your chimney starter. Once the coals have heated through, add them to the middle section where the water container goes, and move around with the metal rod that comes with it. Add in the thin wood chips to your liking, insert the water pan, fill with water, and then you are good to go. It does note to keep the bottom vents open, which I did, and also when placing the cover on, to keep the top vents facing away from the Smokenator 1000. I should also note they somewhat stress to keep the top of the vents open only about the size of a pencil, I believe it was 5/8″. I tried my luck with a pork shoulder, rubbed the way I like, and I’m not joking, this was probably one of the best smoked pork shoulder’s I’ve made to date. Even my wife and kids agreed. They note to check the water container about every hour. I did, and the water held it’s own. I should note that I did add more water about two hours in, and after recently smoking other meats, I did have the water evaporate within the hour, so go ahead and check every hour. I’m not sure how this holds a steady heat, but it held for hours at around 230 degrees, and to me that’s a great temperature for low and slow cooking. After my second attempt at using the Smokenator 1000, I was completely sold. A great investment, especially for those using a 22″ Weber Kettle grill. You can find out more information from their website. Question. Are any of you using the Smokenator 1000, and if so are you pleased with the results?